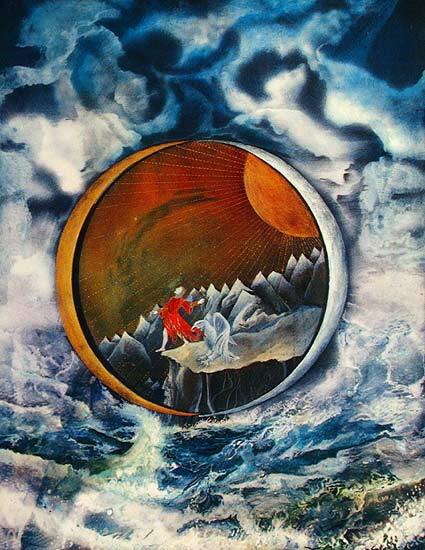 Margarete Petersen's Tarot is extremely abstract ... often not following traditional imagery/symbolism. The deck took twenty-two years to complete, and was Petersen's primary focus during that time span. This is an art deck with modernistic, futuristic quality that opens the reader to the world of spirit. Some of the Major Arcana have been retitled: The Magician = Magic, The Chariot = Chariotess, The Hermit = The Crone, The Hanged Man = Trial, Temperance = Mediatrix, and Judgment = Renewal. The Court Cards are Mother, Father, Daughter, and Son. The minor arcana suits are Flames, Cups, Feathers, and Coins.